They say that sometimes real life is stranger than fiction. They say “you just can’t make this stuff up.” I suppose this story of horrific abuse suffered by Alloma Gilbert and her foster brothers and sisters falls into this category. There are a lot of these child abuse memoirs out there, the covers all look the same. They’re all white with a sad-looking little kid on the front and a sad title in a hand-written style font. I never intended to get really into them as a genre, but I wanted to read just one. I wanted to learn the truths of the way some unfortunate people have had to grow up. I think everybody should. The third thing they say, is that you should never treat anyone badly, because you don’t know their story. This particular story puts that idea firmly into focus. Even after Alloma – renamed Harriet because her birth name was claimed by her foster mother to be evil – escapes her personal hell she continues to get abused in various ways by the people she encounters in life. It’s impossible not to be heartbroken for her and anxiously read on, hoping she’ll finally learn what it means to be loved again. This isn’t a hard task – this book is an absolute page-turner. But it is difficult to take in the gory details. Her casual and conversational style sets you right next to her, and you feel her fear and pain. She describes her life with the deeply evil Eunice Spry without sensationalism, but with the modest hope that one day she will escape. There’s really not much else to say about this except that it will really make you appreciate the life that you have. There will always be someone out there who has it much harder than you, sometimes unspeakably so. If she could get through this and triumph, you can do anything. 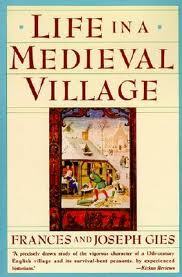 In it’s simplicity, Life in a Medieval Village reminds me of my 8th grade humanities class. The problem is, that class had a lot more style. We even had a medieval fair in the school library at the end of the semester. But this book is extremely well-researched. So well in fact that after reading one anecdote on a certain subject I often had to skip over four more. It’s full of quote after quote from contemporary court rolls too, also demanding to be skipped. But at least it made this already short book a quick read. This would actually be a great book to hand out in those humanities classes. All the information is here, in a way that anyone can understand, and it’s right to the point. And the lack of style, while boring for the layman, means no unnecessary homework time for a high schooler. It’s also not written in grand academic style, which would be a total snoozefest. What I did find interesting was how very intermingled religion, politics, and the economy were at this period. They were all linked, as the peasants and villeins were to the lord they served, and remained virtually locked together this way for hundreds of years. While this book in theory is intended to describe life in medieval villages across Europe, it focuses almost exclusively on the real village of Elton in Huntingdonshire, England. This gives the anecdotes and history an excellent sense of continuity, but left me feeling like other areas were being unfortunately neglected, and this is a terrible omission to make. Britain is often the focus of histories theoretically pertaining to all of Europe, just as New York is so often the focus of histories theoretically pertaining to all of America. I would have found this study to be more valuable if it had perhaps focused on three or four cities in different countries instead of just the one. It wouldn’t have been too great a departure from the structure of the book as it already stands, and we would have the additional benefit of comparing and contrasting the structure and development of society in a few different areas. There’s no way that they were all the same. This certainly doesn’t make it a worthless study in any sense, but I feel like it should at least be retitled to indicate the British focus. It’s impossible not to compare this to another book I read this year, Hubbub: Filth, Noise & Stench in England, about every day life in the early modern period, roughly 400-500 years after life described in Life in a Medieval Village. This was similar in subject matter, but vastly different in approach. Hubbub focused on the oft neglected unpleasant side of life for every day people, and was an absolute riot to read. Its focus was on four English cities. The intent here is to focus on England alone, but keeping the spotlight on four different cities allow us to get a better scope of the issues. While both focus on the every day ordinary person, Hubbub focused more on the negative aspects of life and the experiences of specific individuals, while Life in a Medieval Village is more about the structure that supports that every day life, and the larger group of people living it. This is interesting stuff, if you like history, but it definitely lacked that personal touch. I’m glad I read Life in a Medieval Village, but part of me can’t help but wish Hubbub had gone over there and shaken some life into it.